Empty is the only word that comes to mind when writing about Dumbo, director Tim Burton and writer Ehren Kruger’s 2019 update of Disney’s 1941 animated feature based on the lost book by Helen Aberson and Harold Pearl. The trouble with Dumbo is that there isn’t an ounce of soul present, be it in the blue eyes of a baby elephant with big ears or in the blank stares of every cast member. But where Kruger, who also wrote the scripts for a number of equally uninspired sequels (from Transformers: Revenge of the Fallen and Dark of the Moon and Age of Extinction to The Ring Two and Scream 3), can be blamed for taking a 64-minute film and stretching it into two uneventful hours that lose sight of the titular character, it’s in Burton where the betrayal and ultimate disappointment of Dumbo really lies. From the start of his career, Tim Burton has told the stories of the other. He has brought us oddities and eccentrics, clowns and criminals, failed filmmakers and alarming aliens. As cruel as his sense of humor could often seem and as camp as his characters typically were, there was always a humanity present within these films that one could identify with. They were misunderstood outsiders, a collection of queerness spread across decades, be it the nonsensical Pee-wee and his Big Adventure, or Edward with his Scissorhands, or the engrossing villains of Batman Returns, or the cinematic disasters/gems of Ed Wood, or even Stephen Sondheim’s tortured barber Sweeney Todd. Dumbo fits this mold perfectly. He’s an outsider through and through, born with massive ears that make him easy to ridicule. His journey towards acceptance, as in the original film, is perfectly in tune with Burton’s sensibilities. 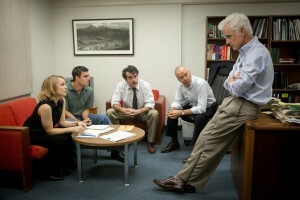 Even the characters that Kruger creates for this updated feature—a girl constantly told she can’t be a scientist, a man who has lost his arm in the war and feels incomplete, a number of circus acts who aren’t good enough for the main stage but have found family in each other—are not surprising subjects for the filmmaker. But Dumbo is hampered by how disinterested Burton seems in exploring how their differences, how their otherness, is what makes them unique and wonderful. They’re used as set design or plot devices, with no character developing an ounce of personality. No one actor has anything to express or anywhere to go, with even Eva Green’s aerial artist being limited to a French accent and Michael Keaton’s villainous showrunner unable to decide what level of camp or menace to go for. Where Burton’s deadpan performances typically serve some purpose in creating a sense of apathy or a humorous atmosphere, the latter especially when in contrast with the theatrics and expressive looks that can pop in at any minute, Dumbo offers nothing but line-reading after line-reading with nothing behind it. When Keaton stares up at the flying elephant, created entirely with special effects that are never especially highlighted outside of constant close-ups of his eyes, and says, “You’ve made me a child again,” something feels lost. It’s forced, nudging you to reminisce about a film you likely barely remember, a film with more heart than anything Kruger’s ever written or anything Burton’s made in years. Sequences just happen, and we’re never allowed to sit and stare in awe at the beauty meant to be unfolding in front of us, though one could hardly call this pallid imitation of a better film beautiful. Where Dumbo’s “Pink Elephants on Parade” sequence was a dedicated five minutes of gorgeous animation that dove into absurdity and fantasy, creating something as oddly engrossing as it was terrifying as a child, Burton’s version is a mess of reaction shots and computer animated bubbles that are never allowed to play on screen for longer than a few seconds. The Burton of yesteryear, who could stage a stunning action set piece or creative musical number or music video, would have had a field day with the visuals he had the ability to reimagine here. Even something as simple as Beetlejuice’s gleeful dance to Harry Belafonte’s “Day-O (The Banana Boat Song)” had a certain looseness to it and an ability to engage with frivolity that’s missing here. This lack of imagination extends past individual set pieces and to the film’s aesthetic as a whole. 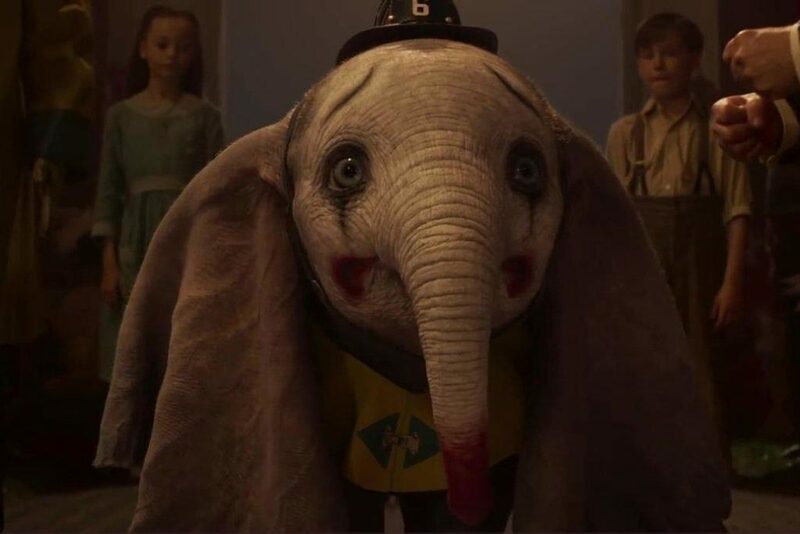 Dumbo has no real interest in exploring the worlds it presents, with everything looking as though it was made in post-production and shot in a room solely comprised of green screens. Long gone are the days of bold, imaginative sets that felt lived in from the moment we entered them. While Burton occasionally borrows from classic cinema—from Busby Berkeley to one of his biggest influences, German expressionism—in how he presents his two circuses and the acts that exist within them, there’s no consistency to any aesthetic. There’s no inspiration from gothic art, another major influence, or even any attempt to borrow from Tod Browning’s Freaks, which seems like the best point of reference for this tale. Any seemingly inspired vision is cut to pieces. Even his version of a technologically-stunning circus looks as though the world’s laziest Disney Imagineer put together a knock-off of Tomorrowland (the theme park area, not the film) and color-corrected it to look as dull and grey as possible. It’s unfortunate to have to write such a disappointed review of a film like Dumbo, a work of art that should have been rich with color and life and fantasy, tailored almost perfectly to a man who had explored the themes inherent to this story before. To borrow a set of lyrics from Sondheim that may seem hypercritical, “It has no presence. No passion. No life.” And that Tim Burton, who was still offering up unique visions within a pedestrian narrative just years ago with something as arguably disposable as Miss Peregrine’s Home for Peculiar Children, has delivered something as soulless as it is heartbreaking. Directed by Tim Burton; written by Ehren Kruger; based on the book by Helen Aberson and Harold Pearl; starring Colin Farrell, Michael Keaton, Danny DeVito, Eva Green, Alan Arkin, Nico Parker, and Finley Hobbins; 112 minutes. Dumbo opens in theaters everywhere on March 29th.